For compulsory military service, see Conscription. Across the world, the large majority of recruits to state armed forces and non-state armed groups are male. The proportion of female personnel varies internationally; for example, it is approximately 3% in India, 10% in the UK, 13% in Sweden, 16% in the US, and 27% in South Africa. While many states do not recruit women for ground close combat roles (i.e. roles which would require them to kill an opponent at close quarters), several have lifted this ban in recent years, including larger Western military powers such as France, the UK, and US. Compared with male personnel and female civilians, female personnel face substantially higher risks of sexual harassment and sexual violence, according to British, Canadian, and US research. Some states, including the UK and US, have begun to recognise a right of transgender people to serve openly in their armed forces, although this development has met with political and cultural resistance. State armed forces set minimum and maximum ages for recruitment. In practice, most military recruits are young adults; for example, in 2013 the average age of a United States Army soldier beginning initial training was 20.7 years. Under the Convention on the Rights of the Child, a child means a person aged under 18. The minimum age at which children may be recruited or conscripted under the Rome Statute of the International Criminal Court is 15. States which have ratified the Optional Protocol to the Convention on the Rights of the Child on the Involvement of Children in Armed Conflict (OPAC) may not conscript children at all, but may enlist children aged 16 or above provided that they are not used to participate directly in hostilities. Historically, the use of children for military purposes has been widespread—see Children in the military—but has been in decline in the 21st century. According to Child Soldiers International, as of 2017 approximately two-thirds of states worldwide had committed to restrict military recruitment to adults from age 18, and at least 60 non-state armed groups had signed agreements to stop or reduce the use of children for military purposes. The organization reported that the so-called Straight 18 standard – the restriction of all military employment to adults – had been emerging as a global norm since 2001. However, Child Soldiers International also reported in 2018 that at least 46 states were recruiting personnel below the age of 18. Most of these states were recruiting from age 17, including Australia, China, France, Germany, Saudi Arabia and the United States (US); approximately 20 were recruiting from age 16, including Brazil, Canada, and the United Kingdom (UK). Most states which recruit children under the age of 18 have undertaken not to deploy them routinely on military operations, having ratified the OPAC treaty. According to the Secretary-General of the United Nations (UNSG), in 2016 14 states were still recruiting and using children in active armed conflicts: Afghanistan, Central African Republic, Colombia, Democratic Republic of Congo, Iraq, Mali, Myanmar, Nigeria, Philippines, Somalia, South Sudan, Sudan, Syria and Yemen. The UNSG also reported that non-state armed groups were recruiting and using children in armed conflict in India, Pakistan, Palestine, Libya, Philippines and Thailand. Cross-cultural studies suggest that, in general, children and young people are drawn to military employment for similar reasons: war, economic motivation, education, family and friends, politics, and identity and psychosocial factors. The hope of escaping socio-economic deprivation is one of the main reasons that young people are attracted to military employment. For example, after the US suspended conscription in 1973, 'the military disproportionately attracted African American men, men from lower-status socioeconomic backgrounds, men who had been in nonacademic high school programs, and men whose high school grades tended to be low'. As an indication of the socio-economic background of British Army personnel, in 2015 three-quarters of its youngest recruits had the literacy skills normally expected of an 11-year-old or younger, and 7% had a reading age of 5–7. The British Army's recruitment drive in 2017 targeted families with an average annual income of £10,000. Recruiters use action films and videogames to promote military employment. 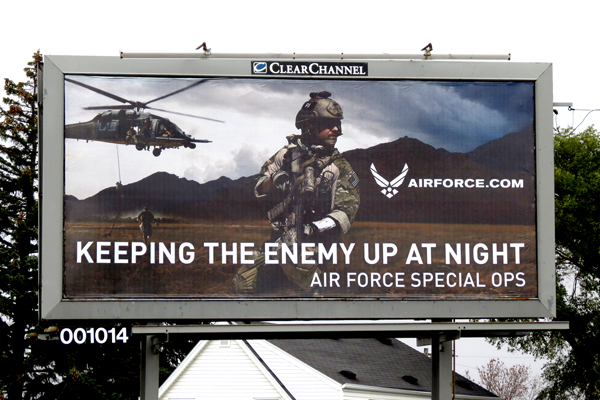 Scenes from Hollywood blockbusters (including Behind Enemy Lines and X-Men: First Class) have been spliced into military advertising in the US, for example. In the US and elsewhere, the armed forces commission bespoke videogames to present military life to children. Many states operate military schools, cadet forces, and other military youth organisations. For example, Russia operates a system of military schools for children from age 10, where combat skills and weapons training are taught as part of the curriculum. The UK is one of many states that subsidise participation in cadet forces, where children from age 12 play out a stylised representation of military employment. Armed forces commission recruitment advertising across a wide range of media, including television, radio, cinema, online including social media, the press, billboards, brochures and leaflets, and through merchandising. Recruiters use civic space to promote their military organisation. Among the methods used are recruitment stalls in public spaces, air shows; military amusement parks, such as Patriot Park in Russia; national days, such as the Belgian national day and military parade; and annual armed forces days. Traditionally masculine associations. Historically and today, recruitment materials frequently associate military life with that of a traditionally masculine warrior, which is officially encouraged as a martial ideal. For example, Cold War US Army slogans included "Join the army, Be a man" and "The army will make a man out of you"; in 2007 a new slogan was introduced: "There’s strong. Then there’s army strong". Similarly, recruiters describe the Israeli infantryman as "discovering all your strengths"; the Russian is "beyond fear"; and the British is "harder, faster, fitter, stronger". Teamwork and belonging. Some armed forces appeal to potential recruits with the promise of teamwork and camaraderie. An example is the British Army, which introduced the slogan "This is belonging" in 2017. Patriotic service. Some armed forces present military life as a patriotic service. For example, the slogan for the German Bundeswehr is "We. Serve. Germany." ["Wir. Dienen. Deutschland. "], and an advertisement for the Israeli Defense Forces encourages potential recruits to "Above all, fight [kravi] for your country, because there is no place better than Israel." Challenge and adventure. Military life is promised to be exciting, including world travel and adventurous training. In 2015, the British Army presentation to schools included prominent images of scuba diving and snowboarding, for example. Education and skills. The armed forces are often presented as a means to learn new skills. For example, the Swedish armed forces encourage potential recruits with the promise of "education that leads to a job where you can make a difference". Typically, candidates for military employment apply online or at a recruitment centre. Many eligibility criteria normally apply, which may be related to age, nationality, height and weight (body mass index), medical history, psychiatric history, illicit drug use, criminal record, literacy and numeracy, proof of identity, satisfactory references, and whether any tattoos are visible. A minimum standard of academic attainment may be required for entry, for certain technical roles, or for entry to train for a leadership position as a commissioned officer. Candidates who meet the criteria will normally also undergo a medical examination, a battery of questions to test aptitude, and tests of physical strength and stamina. Depending on whether the application criteria are met, and depending also on which military units have vacancies for new recruits, candidates may or may not be offered a job in a certain role or roles. Candidates who accept a job offer then wait for their recruit training to begin. Either at or before the start of their training, candidates swear an oath of allegiance and/or sign their joining papers. The period between the initial application to swearing the oath may be several weeks or months. During this time many candidates drop out. For example, in 2017 about 1 in 20 applicants to the British Army were eventually enlisted. Recruits enter a binding contract of service, which for full-time personnel typically requires a minimum period of service of several years, with the exception of a short discharge window, near the beginning of their service, allowing them to leave the armed force as of right. Part-time military employment, known as reserve service, allows a recruit to maintain a civilian job while training under military discipline for a minimum number of days per year. After leaving the armed forces, for a fixed period (between four and six years is normal in the UK and US, for example), former recruits may remain liable for compulsory return to full-time military employment in order to train or deploy on operations. From the point of their enlistment/commissioning, personnel become subject to military law, which introduces offences not recognised by civilian courts, such as disobedience. Penalties range from a summary reprimand to imprisonment for several years following a court martial. Personnel may be posted to bases in their home country or overseas, according to operational need, and may be deployed from those bases on exercises or operations anywhere in the world. Perks of military service typically include adventurous training; subsidised accommodation, meals and travel; and a pension. Some armed forces also subsidise recruits' education before, during and/or after military service, subject to conditions such as an obligatory minimum period of formal military employment; examples are the St Jean military college in Canada, the Welbeck Defence Sixth Form College in the UK, and the GI Bill arrangements in the US. The view that war is immoral (see pacifism) or that military organizations are a tool of imperialism (see anti-imperialism). Evidence that bullying, harassment and sexual violence are more common in military organizations than elsewhere (see, for example, Women in the military and Sexual orientation and gender identity in military service). Evidence that military training and employment lead to higher rates of mental health and behavioural problems than are usually found in civilian life, particularly after personnel have left the armed forces. Evidence that recruiters capitalise on there being a lack of other career options for socio-economically deprived young people, and obscure the risks of military employment. The fact that some armed forces rely on children aged 16 or 17 to fill their ranks, and evidence that these youngest recruits are most likely to be adversely affected by the demands and risks of military life. The opinion that military organizations provide a valuable public service. Anecdotal evidence that military employment benefits young people. The opinion that duty of care policies protect recruits from harm. 'Be the Best.' (British Army). 'Dare to be extraordinary.' (Canadian armed forces). 'We. Serve. Germany.' ['Wir. DIenen. Deutschland.'] (German armed forces). 'For me, for others.' ['Pour moi, pour les autres.'] (French Army). 'Join the fight for Israel.' (Israel Defense Forces). 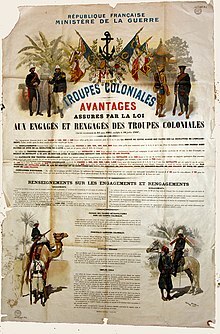 A recruitment poster is a poster used in advertisement to recruit people into an organization, and has been a common method of military recruitment. The American military has had recruiters since the time of the colonies in the 1700s. Today there are thousands of recruiting stations across the United States, serving the Army, Navy, Marines, and Air Force. Recruiting offices normally consist of 2–8 recruiters between the ranks of E-5 and E-7. When a potential applicant walks into a recruiting station his or her height and weight are checked and their background investigated. A finger print scan is conducted and a practice ASVAB exam is given to them. Applicants can not officially swear their enlistment oath in the recruiting office. This is conducted at a Military Entrance Processing Station – MEPS. 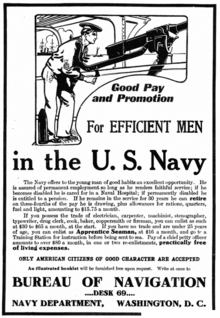 The increased emphasis on a national effort was reflected in World War I recruitment methods. Peter A. Padilla and Mary Riege Laner define six basic appeals to these recruitment campaigns: patriotism, job/career/education, adventure/challenge, social status, travel, and miscellaneous. 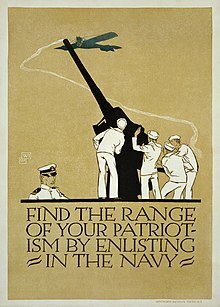 Between 1915 and 1918, 42% of all army recruitment posters were themed primarily by patriotism. And though other themes – such as adventure and greater social status – would play an increased role during World War II recruitment, appeals to serve one's country remained the dominant selling point. In the aftermath of World War II military recruitment shifted significantly. With no war calling men and women to duty, the United States refocused its recruitment efforts to present the military as a career option, and as a means of achieving a higher education. A majority – 55% – of all recruitment posters would serve this end. And though peacetime would not last, factors such as the move to an all-volunteer military would ultimately keep career-oriented recruitment efforts in place. The Defense Department turned to television syndication as a recruiting aid from 1957-1960 with a filmed show, Country Style, USA. On February 20, 1970, the President's Commission on an All-Volunteer Armed Force unanimously agreed that the United States would be best served by an all-volunteer military. In supporting this recommendation, the committee noted that recruitment efforts would have to be intensified, as new enlistees would need to be convinced rather than conscripted. Much like the post-World War II era, these new campaigns put a stronger emphasis on job opportunity. As such, the committee recommended "improved basic compensation and conditions of service, proficiency pay, and accelerated promotions for the highly skilled to make military career opportunities more attractive." These new directives were to be combined with "an intensive recruiting effort." Finalized in mid-1973, the recruitment of a "professional" military was met with success. In 1975 and 1976, military enlistments exceeded expectations, with over 365,000 men and women entering the military. Though this may, in part, have been the result of a lack of civilian jobs during the recession, it nevertheless stands to underline the ways in which recruiting efforts responded to the circumstances of the time. Indeed, recommendations made by the President's Commission continue to work in present-day recruitment efforts. Understanding the need for greater individual incentive, the US military has re-packaged the benefits of the GI Bill. Though originally intended as compensation for service, the bill is now seen as a recruiting tool. Today, the GI Bill is "no longer a reward for service rendered, but an inducement to serve and has become a significant part of recruiter's pitches." ^ Franz-Stefan Gady. "India's Military to Allow Women in Combat Roles". The Diplomat. Retrieved 2017-12-11. ^ UK, Ministry of Defence. "UK armed forces biannual diversity statistics: 2017". www.gov.uk. Retrieved 2017-12-11. ^ Försvarsmakten. "Historik". Försvarsmakten (in Swedish). Retrieved 2017-12-11. ^ a b US Army (2013). "Support Army Recruiting". www.usarec.army.mil. Retrieved 2017-12-11. ^ Engelbrecht, Leon (2011-06-29). "Fact file: SANDF regular force levels by race & gender: April 30, 2011 | defenceWeb". www.defenceweb.co.za. Retrieved 2017-12-11. ^ Fisher, Max (2013-01-25). "Map: Which countries allow women in front-line combat roles?". Washington Post. ISSN 0190-8286. Retrieved 2017-12-11. ^ UK, Ministry of Defence. "Ban on women in ground close combat roles lifted". www.gov.uk. Retrieved 2017-12-11. ^ a b Marshall, A; Panuzio, J; Taft, C (2005). "Intimate partner violence among military veterans and active duty servicemen". Clinical Psychology Review. 25 (7): 862–876. doi:10.1016/j.cpr.2005.05.009. PMID 16006025. ^ Cooper, Helene (2017-12-11). "Transgender People Will Be Allowed to Enlist in the Military as a Court Case Advances". The New York Times. ISSN 0362-4331. Retrieved 2017-12-11. ^ "UK top brass back transgender troops". BBC News. 2017-07-26. Retrieved 2017-12-11. ^ "Rome Statute of the International Criminal Court (A/CONF.183/9)" (PDF). 1998. Retrieved 2018-03-22. ^ "Optional Protocol to the Convention on the Rights of the Child on the Involvement of Children in Armed Conflict". www.ohchr.org. 2000. Retrieved 2018-03-22. ^ a b c d "Where are child soldiers?". Child Soldiers International. Retrieved 2017-12-08. ^ a b Child Soldiers International. "Louder than words: An agenda for action to end state use of child soldiers". Retrieved 2017-12-08. ^ Child Soldiers International (2018). "Child Soldiers World Index". Retrieved 2018-06-16. ^ a b Secretary-General of the United Nations (2017). "Children and armed conflict: Report of the Secretary-General". undocs.org. Retrieved 2017-12-08. ^ a b "Machel Study 10-Year Strategic Review: Children and conflict in a changing world". UNICEF. Retrieved 2017-12-08. ^ a b c Segal, D R; et al. (1998). "The all-volunteer force in the 1970s". Social Science Quarterly. 72 (2): 390–411. JSTOR 42863796. ^ a b c Gee, David; Taylor, Rachel (2016-11-01). "Is it Counterproductive to Enlist Minors into the Army?". The RUSI Journal. 161 (6): 36–48. doi:10.1080/03071847.2016.1265837. ISSN 0307-1847. ^ a b Morris, Steven (2017-07-09). "British army is targeting working-class young people, report shows". The Guardian. ISSN 0261-3077. Retrieved 2017-12-08. ^ Saint-Jean, Departement of National Defence, Chief Military Personnel, Canadian Defence Academy, Royal Military College (2015-05-12). "Admission - Futurs Students - Royal Military College Saint-Jean". www.cmrsj-rmcsj.forces.gc.ca. Retrieved 2017-12-08. ^ a b c d Germany, Bundestag Commission for Children's Concerns (2016). Opinion of the Commission for Children's Concerns on the relationship between the military and young people in Germany. ^ a b New Profile (2004). "The New Profile Report on Child Recruitment in Israel" (PDF). Retrieved 2017-12-10. ^ a b US Army. "Recruiter Handbook" (PDF). Retrieved 2017-12-10. ^ a b US Government (2001). "No Child Left Behind Act (2001) (Section 9528)". Retrieved 2017-12-10. ^ British Army. "Meet the army: A guide for parents, partners and friends" (PDF). Archived from the original (PDF) on 2014-09-03. Retrieved 2017-12-10. ^ Australia, Department of Defence (2006). "Final report of the Learning Culture Inquiry" (PDF). Retrieved 2017-12-13. ^ UK, British Army (2010). "Army Doctrine Publications: Operations" (PDF). Retrieved 2017-12-13. ^ US Army. "Warrior Ethos - Army Values". www.army.mil. Retrieved 2017-12-13. ^ Arkin, William; Dobrofsky, Lynne R. (1978-01-01). "Military Socialization and Masculinity". Journal of Social Issues. 34 (1): 151–168. doi:10.1111/j.1540-4560.1978.tb02546.x. ISSN 1540-4560. ^ US Army (2007). "2008 U.S. Army Posture Statement - Information Papers - Army Strong: New Army Recruiting Campaign". www.army.mil. Retrieved 2017-12-13. ^ UK, Army Recruiting and Training Division (2013). Army Life: Your Guide to the Infantry. UK, Ministry of Defence. ^ a b UK, British Army (2017). "British Army Jobs - Apply Online". apply.army.mod.uk. Retrieved 2017-12-13. ^ UK, British Army (2015). "Army presentation for schools". www.forceswatch.net. Retrieved 2017-12-13. ^ Canada, National Defence. "Paid education and other benefits". www.canada.ca. Retrieved 2017-12-13. ^ UK, Ministry of Defence (2017). Information obtained under the Freedom of Information Act, ref. FOI2017/10089/79534. ^ UK, Ministry of Defence (2017). "Queen's Regulations for the Army (1975, as amended)" (PDF). Retrieved 2017-12-09. ^ a b c Gee, D (2008). "Informed Choice? Armed forces recruitment practices in the United Kingdom". Retrieved 2017-12-13. ^ Hoge, Charles W.; Castro, Carl A.; Messer, Stephen C.; McGurk, Dennis; Cotting, Dave I.; Koffman, Robert L. (2004-07-01). "Combat Duty in Iraq and Afghanistan, Mental Health Problems, and Barriers to Care". New England Journal of Medicine. 351 (1): 13–22. CiteSeerX 10.1.1.376.5881. doi:10.1056/nejmoa040603. ISSN 0028-4793. PMID 15229303. ^ MacManus, Deirdre; Rona, Roberto; Dickson, Hannah; Somaini, Greta; Fear, Nicola; Wessely, Simon (2015-01-01). "Aggressive and Violent Behavior Among Military Personnel Deployed to Iraq and Afghanistan: Prevalence and Link With Deployment and Combat Exposure". Epidemiologic Reviews. 37 (1): 196–212. doi:10.1093/epirev/mxu006. ISSN 0193-936X. PMID 25613552. ^ Goodwin, L.; Wessely, S.; Hotopf, M.; Jones, M.; Greenberg, N.; Rona, R. J.; Hull, L.; Fear, N. T. (2015). "Are common mental disorders more prevalent in the UK serving military compared to the general working population?". Psychological Medicine. 45 (9): 1881–1891. doi:10.1017/s0033291714002980. ISSN 0033-2917. PMID 25602942. ^ MacManus, Deirdre; Dean, Kimberlie; Jones, Margaret; Rona, Roberto J; Greenberg, Neil; Hull, Lisa; Fahy, Tom; Wessely, Simon; Fear, Nicola T (2013). "Violent offending by UK military personnel deployed to Iraq and Afghanistan: a data linkage cohort study". The Lancet. 381 (9870): 907–917. doi:10.1016/s0140-6736(13)60354-2. PMID 23499041. ^ Thandi, Gursimran; Sundin, Josefin; Ng-Knight, Terry; Jones, Margaret; Hull, Lisa; Jones, Norman; Greenberg, Neil; Rona, Roberto J.; Wessely, Simon (2015). "Alcohol misuse in the United Kingdom Armed Forces: A longitudinal study". Drug and Alcohol Dependence. 156: 78–83. doi:10.1016/j.drugalcdep.2015.08.033. PMID 26409753. ^ Buckman, Joshua E. J.; Forbes, Harriet J.; Clayton, Tim; Jones, Margaret; Jones, Norman; Greenberg, Neil; Sundin, Josefin; Hull, Lisa; Wessely, Simon (2013-06-01). "Early Service leavers: a study of the factors associated with premature separation from the UK Armed Forces and the mental health of those that leave early". European Journal of Public Health. 23 (3): 410–415. doi:10.1093/eurpub/cks042. ISSN 1101-1262. PMID 22539627. ^ Jones, M.; Sundin, J.; Goodwin, L.; Hull, L.; Fear, N. T.; Wessely, S.; Rona, R. J. (2013). "What explains post-traumatic stress disorder (PTSD) in UK service personnel: deployment or something else?". Psychological Medicine. 43 (8): 1703–1712. doi:10.1017/s0033291712002619. ISSN 0033-2917. PMID 23199850. ^ Hagopian, Amy; Barker, Kathy (2011-01-01). "Should We End Military Recruiting in High Schools as a Matter of Child Protection and Public Health?". American Journal of Public Health. 101 (1): 19–23. doi:10.2105/ajph.2009.183418. ISSN 0090-0036. PMC 3000735. PMID 21088269. ^ American Public Health Association (2012). "Cessation of Military Recruiting in Public Elementary and Secondary Schools". www.apha.org. Retrieved 2017-12-13. ^ Diener, Sam; Munro, Jamie (June–July 2005). "Military Money for College: A Reality Check". Peacework. AFSC. Archived from the original on 2006-10-11. ^ "Amid Scandal, Recruitment Halts". CBS News. 2005-05-20. ^ a b Gee, D (2017). "The First Ambush? Effects of army training and employment" (PDF). Retrieved 2017-12-13. ^ Knapik; et al. (2004). "A review of the literature on attrition from the military services: Risk factors for attrition and strategies to reduce attrition". Retrieved 2017-12-13. ^ UK, Ministry of Defence (2017). "UK armed forces suicide and open verdict deaths: 2016". www.gov.uk. Retrieved 2017-12-13. ^ Kapur, Navneet; While, David; Blatchley, Nick; Bray, Isabelle; Harrison, Kate (2009-03-03). "Suicide after Leaving the UK Armed Forces —A Cohort Study". PLOS Medicine. 6 (3): e1000026. doi:10.1371/journal.pmed.1000026. ISSN 1549-1676. PMC 2650723. PMID 19260757. ^ Hansard (2016). "Armed Forces Bill 2016 (col. 1211)". hansard.parliament.uk. Retrieved 2017-12-13. ^ Hansard (2016). "Armed Forces Bill 2016 (col. 1210)". hansard.parliament.uk. Retrieved 2017-12-13. ^ "Commonwealth War Graves Commission Report on India 2007–2008" (PDF). Archived from the original (PDF) on 2010-06-18. Retrieved 2009-09-07. ^ "Marching orders for teenage soldiers?". BBC News. June 22, 1998. Retrieved May 12, 2010. ^ "MoD denies 'war glamour' claim". BBC News. January 7, 2008. Retrieved May 12, 2010. ^ "Teachers reject 'Army propaganda'". BBC News. March 25, 2008. Retrieved May 12, 2010. ^ The Report of the President's Commission on an All-Volunteer Armed Force. New York: The Macmillan Company, 1970. Page 18. ^ White, John B. Lieutenant Commander, US Naval Reserve, Ph. D. "The GI Bill: Recruiting Bonus, Retention Onus." Military Review, July–August 2004. Manigart, Philippe. "Risks and Recruitment in Postmodern Armed Forces: The Case of Belgium." Armed Forces & Society, Jul 2005; vol. 31: pp. 559–582. Dandeker, Christopher and Alan Strachan. "Soldier Recruitment to the British Army: a Spatial and Social Methodology for Analysis and Monitoring." Armed Forces & Society, Jan 1993; vol. 19: pp. 279–290. Snyder, William P. "Officer Recruitment for the All-Volunteer Force: Trends and Prospects." Armed Forces & Society, Apr 1984; vol. 10: pp. 401–425. Griffith, James. "Institutional Motives for Serving in the U.S. Army National Guard: Implications for Recruitment, Retention, and Readiness." Armed Forces & Society, Jan 2008; vol. 34: pp. 230–258. Fitzgerald, John A. "Changing Patterns of Officer Recruitment at the U.S. Naval Academy." Armed Forces & Society, Oct 1981; vol. 8: pp. 111–128.